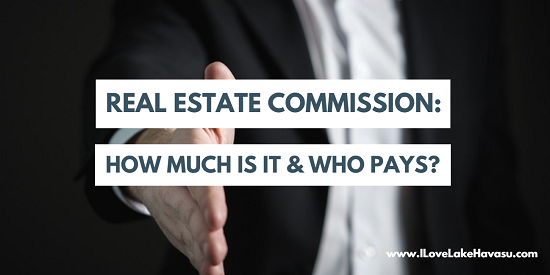 Real Estate Commission: How Much and Who Pays? No matter how personal it may feel, a Havasu home sale is a transaction. When you hire a REALTOR® to handle this business for you, they earn a real estate commission for their services. Have you ever wondered how much they make and who has to pay this fee? As the seller, this may be of particular interest to you. First of all, let’s start with the basics. What is a real estate commission? This is the fee sellers pay their listing agent for the work they do in selling a home. Unlike hourly employees or “per project” pricing, agents only receive their real estate commission when a property sells. If a deal falls through, the house goes back on the market. Then, the REALTOR® must start all over again. In other words, no sale, no payment. All fees get paid once escrow closes. Sometimes, though, the REALTOR® may still be owed fees if the seller backs out of the deal. So, pay attention to what’s written in your listing agreement to make sure you understand how much an agent is paid and when. How Much Does a REALTOR® Earn for Their Commission? While not regulated by law, REALTORS® typically earn 6% of the sale price as their real estate commission. The specific terms should be defined in your listing agreement. A check for the agreed upon amount gets cut from the proceeds of the sale. However, the check doesn’t go directly to the real estate agent. Instead, it will be made out to the company they work for. Then, that check gets divided up and disbursed to the appropriate parties (listing agent, buyer’s broker, etc.). The seller usually pays the total real estate commission. Again, though, this happens at the close of escrow and comes from the proceeds of the sale. The buyer’s broker receives a portion of the real estate commission based on the agreement between the seller’s agent’s brokerage and the buyer’s agent’s brokerage. The buyer and seller themselves aren’t involved in that arrangement. I hope this real estate commission primer helped you understand what and how an agent gets paid. If you have any further questions, please feel free to contact me. I’d be happy to explain this so that you thoroughly understand what we do for you. « What Could Be Hindering Your Havasu Home Sale?